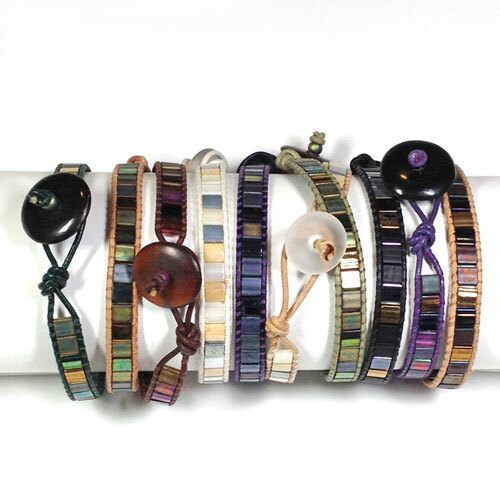 Make your own wrap bracelets with beads, leather and nylon thread or cord. Get a kit with directions and extra material to make bracelets in more color combinations. The directions were written after making many bracelets and working out all the kinks. Check the blog for close up pictures of work in progress > Demo. 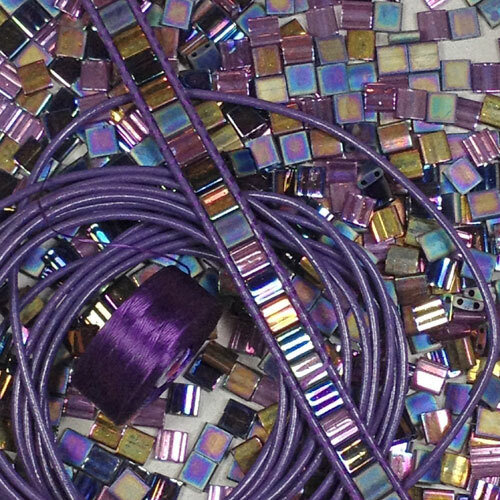 If you already have leather and C-Lon Bead Thread Size D, get a few packs of Tila Bead Mix. These bracelets are fun, easy to wear and addictive, plus they can be stacked! 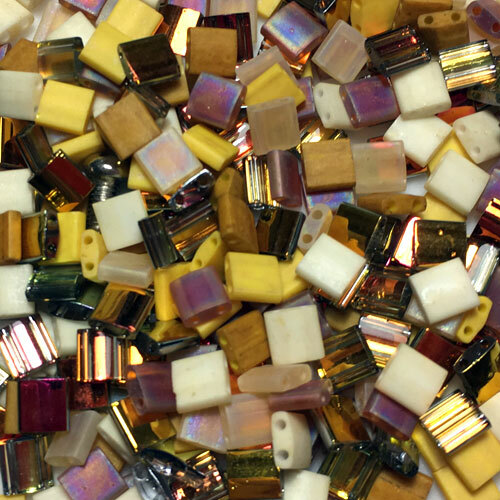 Tila beads are flat, light, and very smooth glass beads made by Miyuki. They measure 5mm x 5mm x 1.9mm with 2 parallel holes about 0.8mm wide. They are like of miniaturized mosaic tiles found in Europe. These beads were introduced by Miyuki in 2010. In addition to the materials included in the kit, you will need scissors, cutting shears, a macrame board with T-pins and/or mini-clips or an alternative boards such as a clip board, a bead tray, cardboard or foam board, plus an adhesive such as Poly Zap, GS-Hypo Cement or Fray Check. These tools and adhesives are not included in the kit. Tilas measure 5mm x 5mm x 1.9mm with 2 parallel holes about 0.8mm wide. The mixes are made with 4 to 5 Tila bead colors with various finishes mixed together in set proportions to create a perfect balance. Some of the finishes are shiny, others are matte, iridescent and metallic. Copyrights - This design is an adaptation of a traditional design. Only the instructions are copyrighted, not the actual design. You welcome to make and sell as many bracelets as you wish but please understand that the instructions are for personal use only. If you would like to use these instructions to teach, buy kits for your students. Do not duplicate the instructions either in print or in an electronic manner. When purchasing the kit listed above, it is assumed that you agree with the copyright terms of this document included in the kit. Thanks for understanding!